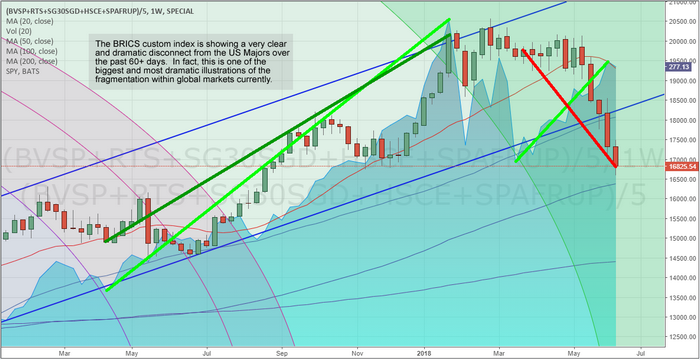 Well over a month ago we warned our followers of a “capital market shift” that was taking place in the global markets. Nearly 3 months before that time, we warned that China’s economy was about to enter a sustained economic downtrend cycle that could be dangerous to the global markets. Today, we offer further evidence that the global markets are, in fact, shifting away from a price correlation to the US stock market and this move could be a warning sign that emerging markets and global markets could lead the world into an extended stagflation cycle. Think about this for a minute, as we briefly discussed in our last article, what would happen if the US markets continued to rally on a strong economy with strong consumer participation while the US Fed was slow to raise interest rates while supporting a transitional shift of the US economy towards more manufacturing, technology, and expectations? How would the world’s economies react to such a shift given their current economic cycles and opportunities? Would they be able to keep up with the US or would they start to trail further and further behind the US? It is our belief that any continued strengthening of the US economy could, in fact, present real dangers for many of the world’s economies simply because they may fall completely out of sync with the US stock market as their currencies, economies and consumer expectations fail to keep up with the US capabilities. How all of this will play out over the next few months/years is our concern. We know it will result in some tremendous trading opportunities for investors, but it could also create a new class of undervalued assets that could present some real long-term opportunity over the next 20+ years. Let’s start by taking a look at our China/Asia custom index to show how the past 60+ days have more clearly shown this price disconnect happening. When you look at this chart, pay attention to how closely this custom index (the candles) have moved in relation to the SPY (the blue area chart overlaid onto the candles). Notice how the moves in the SPY were relatively closely mirrored by the custom index. This is a direct price correlation to the SPY over an extended period of time. Now, focus on the last 6~9 bars on this chart and take a really close look at how the SPY has rallied higher while this custom index has stayed flat to lower over the same time frame. The only answer for this type of price disconnect is that a global capital shift could be underway that is driving capital out of certain markets and away from risk and danger. In other words, it is our opinion that the China/Asia markets are starting to be perceived as riskier and more dangerous in relation to the US market and other more mature markets. Now, let’s take a look at the BRICS custom index. YIKES!! What happened here? Through most of 2017, a price correlation can be seen where the BRICS index moved somewhat in unison with the SPY price activity – although in some cases a bit delayed. Yet, after March 2018, something dramatic happened. When the SPY rotated lower in late March 2018, the BRICS index stayed relatively flat near the highs. Then in May 2018, a price disconnect became very evident as the SPY began to rally while the BRICS index began to sell-off – very dramatically. The BRICS index also broke through the BLUE price channel recently which is another sign that price trends/activities have shifted. You should now be starting to see what we have been warning you about for months – the global capital market shift that is taking place. This is happening because mature nations and economies are capable of achieving great economic growth and stability than many foreign markets and because many foreign markets have squandered the last 10+ years attempting to expand externally and not support their fundamental economic needs. As we have used this example before, a flower only has two modes of operation – flower mode (expand) or survive (keep the core plant alive). We believe these foreign markets have been in “flower mode” for the past 10+ years and have failed to support the core elements of their economies. Now, onto more examples, this time Western Europe. 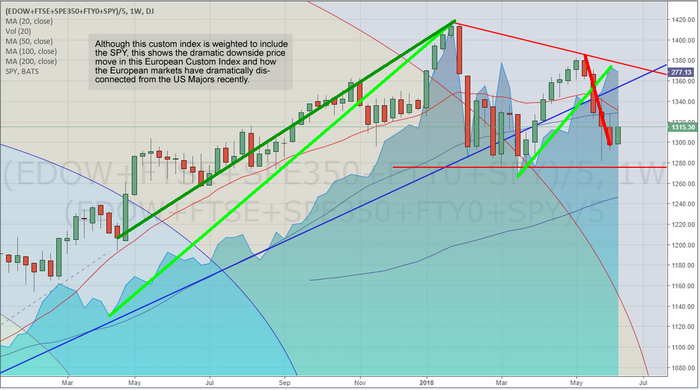 Again, this custom index is weighted with the SPY, so it should reflect some of the price support of the recent uptrend. Yet, we see the most recent few weeks of this chart have shown a dramatic downtrend? This would indicate that the European markets/currencies are disconnecting from the US majors at a much more dramatic pace, recently, that they have been over the past few years. Yikes! What about India & SE Asia? Our custom India index has shown relatively FLAT recent price activity compared to the SPY. Overall, our opinion is that India has yet to completely diverge from the US majors and we urge all investors to be aware that any further price breakdown in this India custom index will warn that the Indian/SE Asian economies are losing their battle to stay correlated to the US markets going forward. Right now, there is evidence of weakness in the India custom index – yet there are limited signs of a broken correlation to the US markets. It certainly shows that this price disconnect could be happening and likely is happening – yet we don’t have clear signs that this custom index is breaking to new lows (yet). Lastly, lets take a look at our Russia/Eastern Europe custom index for signs of a price disconnect. 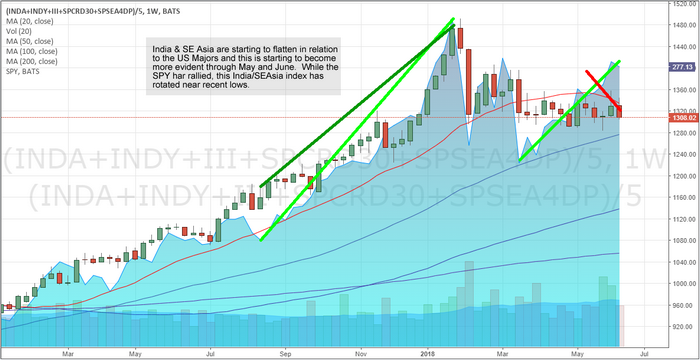 This chart is somewhat similar to the India chart (above). 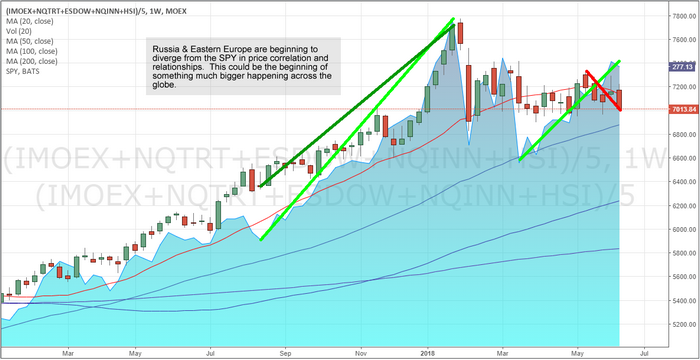 There are signs of weakness and downside price rotation while the SPY has been rallying, yet there is not massive disconnect evident on the right edge of the chart. We believe the recent downside price rotation within this custom index are the early warning signs of a price disconnect in the early stages of setting up (just like in the India chart). We believe these charts clearly show that the US market (and other mature economies) are advancing beyond the functional capabilities of many emerging and foreign markets. What will come from this, if it continues to play out as we expect, is a huge number of opportunities for traders and investors. The next 3 to 5 years are likely to be very interesting and exciting for traders and investors. These types of moves don’t happen too often and should these markets continue to rotate as we are expecting, we could see some very big currency and foreign market moves over the next few months and years. You owe it to yourself to stay ahead of this move and learn how to profits from the extended volatility that will likely result from this price disconnect. 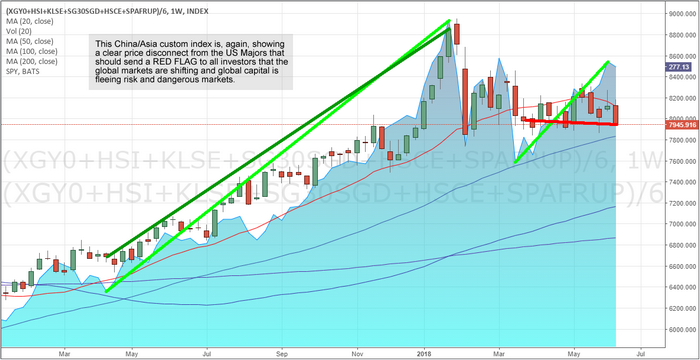 We believe we have nailed this analysis as we have correctly called the weakness in China/Asia as well as the global capital shift that is starting to play out in the global markets. We already know what will likely move and when we should expect these opportunities to set up. We are preparing our valued subscribers for this move and protecting them by providing them even more detailed research and analysis than you are seeing here. Visit www.TheTechnicalTraders.com to learn how this could be the biggest opportunity of your trading and investing life and how you need a qualified and dedicated team of researchers to help you stay ahead of these moves over the next 2+ years with our long-term discounted subscription plan and Save 39%. There will come a time when you will be wishing you had access to our proprietary research and member-only trade alerts and investment positions. Become a technical trader today and prosper with us!